Figuring out what you and your friends are going to do this summer isn't nearly as tough as figuring out what you're going to drink this summer. Well, here's your cocktailing itinerary: Margarita Summer, 2010. Kicking off Cinco de Mayo, Margarita Summer celebrates history's most festive beverage through a majestic series of events and promotions. Taking place at over 50 bars & restaurants, it honors the cocktail invented poolside by Dallas socialite Margarita Sames at her Acapulco hacienda, and since enjoyed by leisure-lovers the world over, even in Aca-Pittsburgh, where haciendas are called "houses", and pools are called "inflatable". Cazadores 100% Blue Agave Tequila: The world's #1-selling premium tequila (and #1 overall in Mexico -- if it's good enough for them...), this all-natural tequila embodies the sweet, fruity notes of Jalisco's highlands. For more rounded flavor, it's aged extra long in new white-oak barrels, and is actually fermented to the music of Mozart -- far more nurturing than the smooth jazz you were fermented to. 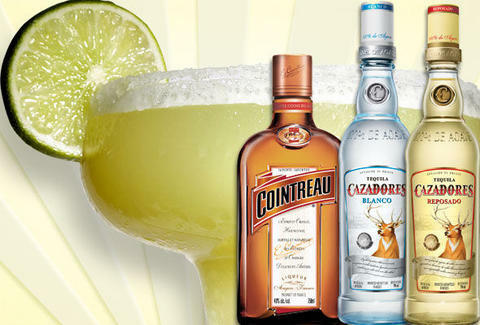 Cointreau: Invented in 1875 and used by Sames herself, the original triple sec enhances taste and color with all-natural ingredients, and eschews the hangover-causing sugars of other popular liqueurs; its alcohol content's also more stalwart than competitors, because the only drink that should be watered down, is water. And even that's debatable. Going beyond the basics, the spots'll serve creative variations, from the cucumber/mint/muddled strawberry Cointreau Copa, to the chipotle-syruped Spicy Mango, which thankfully doesn't come in tight lamé shorts. As for the crucial info: Check out MargaritaSummer.com for more recipes, information on the participating venues and get the where, and when -- if you need a "why", you're gonna need more than a summer to figure things out. Assuming you enjoy margaritas, this is truly a summer of love. Click here to find out where you'll be spending it, or follow us @MargaritaNY.